When you get a new job, the whole money thing is laid out for you in a nice, little package called a salary. $40,000 a year plus stock in the company. $55,000 a year and benefits. $8 an hour and pennies from the tip jar divided six ways with your fellow barristas while serving coffee-starved, bleary-eyed customers. Sure, you might be able to negotiate a bit with your employer, but for the most part, the dollar value of your work is predetermined. This couldn’t be further from the truth when you are a freelancer. 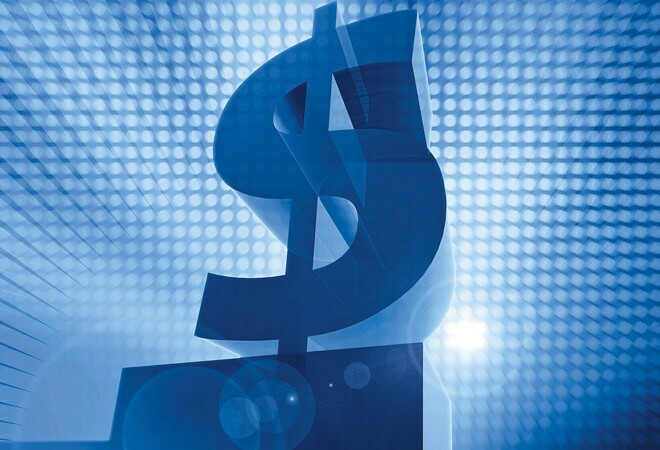 So how do you go about determining what to charge for your services? How do you know what the going rate in your area is for an independent videographer? Or for a dance instructor? Art teacher? Interpreter? Chess tutor? Web designer? The truth is, there isn’t really a “suggested rate” for any of these freelance professions. There is, however, a great formula you can use that will help you make a determination about what is not only fair to charge your clients, but also good for your business. This part will take a little bit of research. Go to Salary.com and type in the profession that most closely matches the business you are starting, or freelance work you are performing. I chose “Web Designer” for this example. On the next screen you will get a list of occupations that the site thinks is the closest to the profession you have entered. Choose the one that most-closely matches yours from this list. I chose “Web Designer 1”. For the record, the number following some of these profession titles is simply your skill level in your profession. A “Web Designer 3” would be a designer with about 5-10 years of experience. A new window will pop-up showing the national salary averages for your profession. 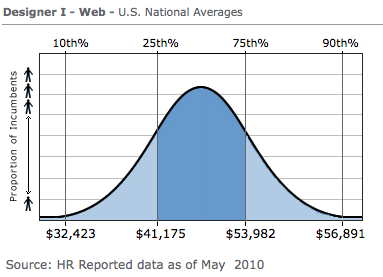 In my example, the 50th percentile (where the bell curve in the diagram is closest to the top) is around $47,000 per year. For the purposes of setting your hourly rate, drop the final three digits. This leaves us with 47. Take the number you got above and divide it by 2. This left me with about 23. Now, ask yourself how much work you can expect (in hours) per week. If you expect to get close to full-time work from your clients (40 hours per week) round this number up to the nearest multiple of 10. This is your final hourly rate to charge for your services. In my example, it would be $30 an hour. If you expect to get less work early on, consider adding another $10 an hour to the final total. This would leave us with $40 an hour to charge as a level 1 Freelance Web Designer. In the End, Who Determines Your Rates? You do! And… so do your customers. The truth is, for any freelancer, business owner or entrepreneur, your appropriate rates are whatever makes the most sense for your business. If you charge $450 an hour for trombone lessons, you probably aren’t going to get many clients. On the other hand, if your rate for Spanish lessons are $1.75 a class, you won’t be able to cover your basic expenses! Your clients also might see you as a beginner or a talentless hack if you undercharge. Don’t undersell yourself! In the beginning when you don’t have many clients, it’s ok to experiment a bit with your rates (as long as you are fair to your current clients!) There are no “shoulds” in the freelance world. Hopefully the formula above gave you some idea about what to charge for your services – but it is meant as a guide only! You could have a very successful business charging twice the amount the formula gives you.